When I heard about Liesl Gibson's new Building Block Dress book, I was super excited to see it. Not only has she chosen to self-publish it, but the book itself is like having a garment teacher in your sewing room. Your very own Liesl Gibson, if you will. Liesl's Oliver + S patterns are some of the first modern garment sewing patterns I first noticed when I first started quilting that made me think to myself, hey, maybe I should try sewing garments! The Building Block Dress book is focused on the art of learning a simple dress, the Building Block Dress, and then learning a zillion ways to alter or customize it, to make it in a bunch of different ways, essentially giving you a ton of new skills along the way. I look forward to spending more time with this book because I know I am going to learn ever so much from it!!! There's custom sleeves, different skirt options, pockets, necklines, you name it. Remember those Choose Your Own Adventure books? It's like that, but with garment patterns, in sizes from 6 months all the way up through size 12. For a beginning seamstress like me, it's a little overwhelming to start from, but at the same time, it's super exciting because I know it's the kind of book I'll come back to over and over again. In fact, I need to take it to my local UPS Store to get the binding cut off so I can have them spiralize it! I started off planning to make a sleeveless tunic for my daughter, Lorelei, who's now nine months old and crawling up a storm. I still love putting her in dresses, but she seems to get kind of irritated by them lately, because they get caught under her knees. Measuring her to figure out how long I could make a tunic however, proved to be easier said than done so what I thought could be a tunic, really wound up being a dress. For that same reason, I also didn't quite follow Liesl's advice about making a muslin - though I think maybe next time, or maybe when she stops growing so quickly, I will go that route. I definitely can see why that would be wise. While not everything went exactly as planned in making this dress, partly because I managed to slam my thumb in a car door (for the record, it's my right thumb, not shown above, and you're welcome for that!) and it severely changed my hand's normal mobility, I'm still super proud that I made this dress. I love that I sewed a bias neckline. I love that I shortened the bodice and skirt of the dress without fear. I love that my dress is unique, and is a mish-mash of many different techniques in the book. I think it looks adorable and I can't wait to plan out my next Building Block dress. You can check out all things Oliver + S, including their fantastic patterns, great videos and tutorials and so forth on their website right here. And best of all, you can find the new book right here. Thanks for all the encouraging comments last week! They were just the kick in the pants I needed! I spent the weekend, well the free time at least, working on my first Geranium dress. If you haven't heard of the Geranium dress, it's a super adorable little girls' dress or top pattern by the indomitable Rae Hoekstra (a.k.a. Made by Rae), and it's a garment pattern that I've heard from some friends was not entirely scary, so I decided to go for it, after my successful attempt at knits. I will say this - I tend to bite off more than I can chew, so to start with, I truly considered making four of them. At once. Then the rational side of me took over and I decided to try one first, sew it all the way through, before cutting into the other pretty, pretty fabrics I gathered for my Geranium possibilities pile. I narrowed it down to a gorgeous Eastham by Denyse Schmidt print, and got to pressing and cutting. Everything was going well with the cutting and such until I got to the actual sewing and realized that while I thought "View A" in the pattern was the cuter of the options (though both are adorable), it was also the more challenging one, for me, because it required gathering, which I am absolutely dreadful at. I always pull the threads so hard that I break them. And unsurprisingly, I did just that in this project, but kept on trucking and gathered the best I could. Aside from the gathering, I didn't really struggle much. I fully expected to struggle. A lot. With the whole three dimensional-ness of garment sewing, I expected that I'd have a hard time understanding what to do and where, but the instructions are written quite well, very clear and concise at the same time, so it was really a breeze. The dress still needs buttons or snaps - I haven't decided which yet, in part because I've never installed either, but also because the mom in me thinks the snaps are more practical and I don't have any so it requires a trip to Jo-Ann's - but other than that, it's totally done. All hemmed and everything. And it's super cute! And it even fits her! Look how darned adorable she is in it! 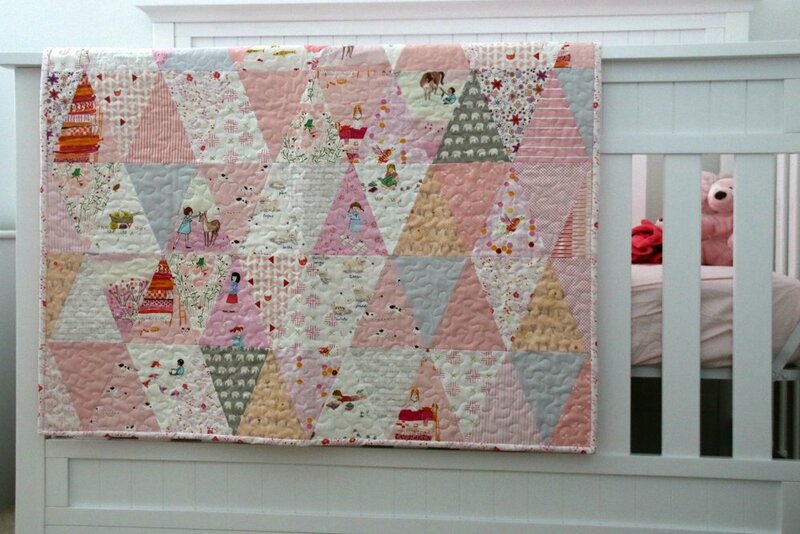 And I say "first girlie quilt" because I suspect there will be more at some point. I have to say, finding out that the new baby is going to be a girl was really exciting for a number of reasons, one of which was thinking of all of the adorable fabrics that I've hoarded over the years that just haven't been right for the numerous quilts I've made for the munchkin over the years. It was fun to pull out loads of Heather Ross and Sarah Jane and Aneela Hoey fabrics to make the first girlie cutesy quilt for my daughter-to-be. Deciding what exactly I wanted to make was hard, but I knew I wanted some simple patchwork. Don't get me wrong, or worry that the pregnancy hormones have somehow broken my love for paper piecing, I still love it! 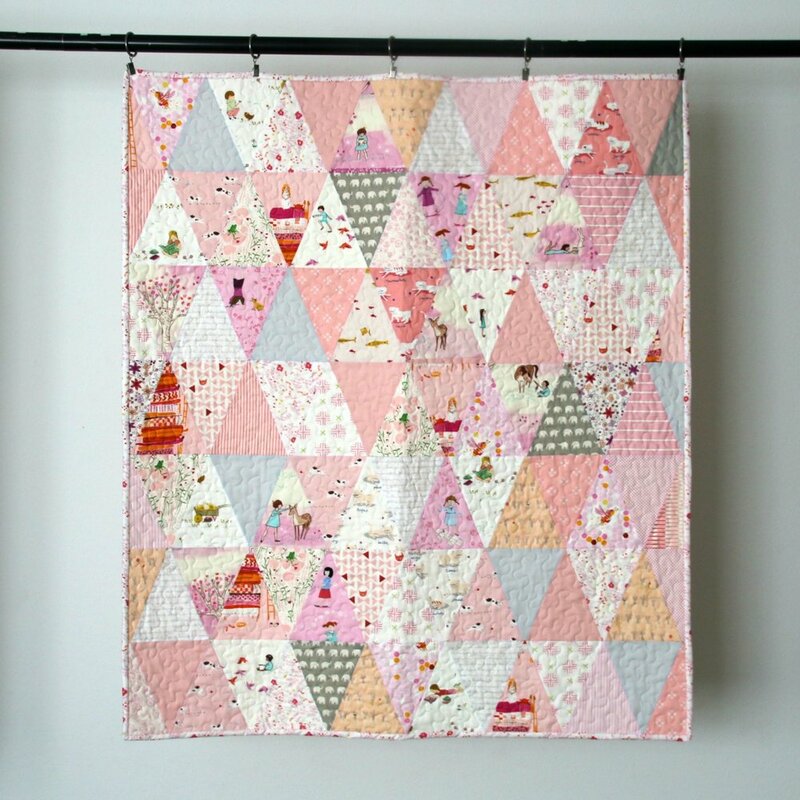 I just knew that for this quilt I really wanted the fabrics to be the stars, rather than the piecing, so I kept it simple and cut a boatload of isosceles triangles and started throwing them onto my design wall. I stuck with the concept of keeping it simple for the quilting, opting for a simple meandering stipple in my trusty white Aurifil (#2024), and then bound it in a super sweet, soft print from Sarah Jane's Wee Wander collection, called Meandering in Petal. It had just the right amount of softness to bind the whole thing together, no pun intended! I'm pleased to finally have a summer finish to share that's fully quilted and bound and truly finished! The summer seems to be flying by, full of family time, work, trips to the pool, and very little sewing, but this project was a bit of a priority for me - because of the recipient. We recently found out that our munchkin will no longer be a "lonely child" (as he calls an "only child") - I'm expecting a new baby early in the new year! All three of us are mighty excited, and naturally, I channeled my excitement into making a quilt for the baby. 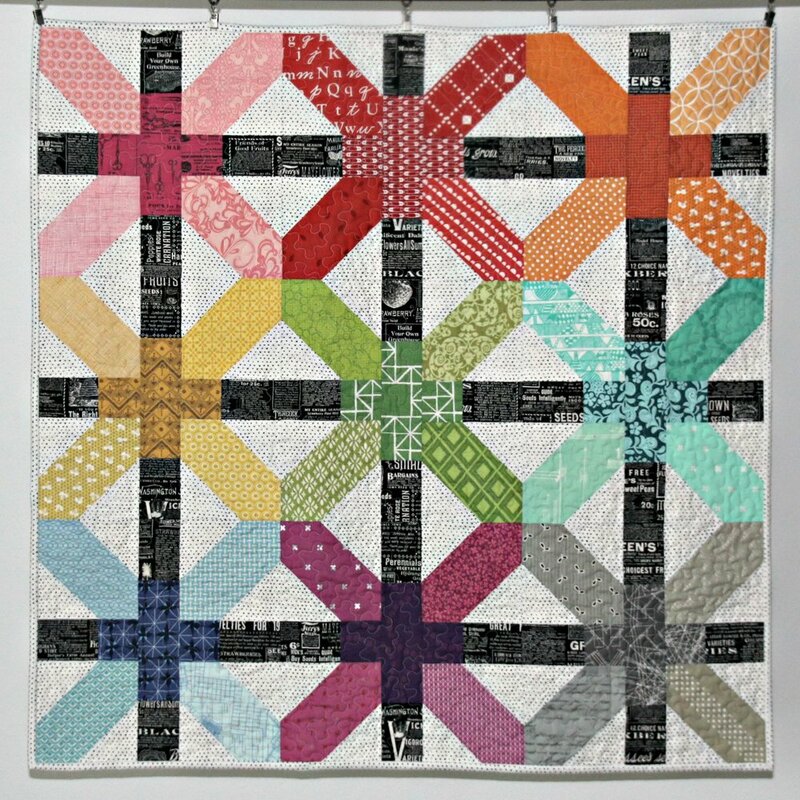 We don't know if it's a boy or girl yet, so I went with a simple bright, rainbow color scheme that will work well for either, and I picked a block that has been on my quilty bucket list for a long time - the X Plus block. These blocks are SO addictive, and so quick to make! I dug into my scrap bins for the rainbow colors and pulled two of my favorite basics, an old out of print Lakehouse seed catalog print, and a cute tiny black heart print on white by Dear Stella, to mix them up with. I love the simplicity of the piecing in this quilt, so I kept it super simple with the quilting and binding - just a simple stipple in my trusty white #2024 Aurifil thread and then I bound it using that same sweet heart print that I used throughout the blocks. from her line, First Light. This line is sooooo pretty! Navies and citrons and grays mixed with a pop of pink and a wee bit of teal, in beautifully detailed prints. Just the right amount of mellow softness compared to the bright quilt top! , and have a great Monday!